We are the only full-service restaurant and hospitality consulting firm that creates or finds radically differentiated branded restaurant experiences for owners; hotels; entertainment, cultural and academic venues; casinos; corporate foodservice; real estate developers; and retailers. With over 25 years of practical experience and a world class network, we completely understand how to deliver unique, memorable, culinary concepts for your guests while achieving healthy cash flow. We actively guide you through the complexities of the journey both nationally and internationally. We are passionate, creative, and think outside the box to discover the potential in each situation. Arlene Spiegel, founder and President of Arlene Spiegel & Associates, is a restaurant, retail and foodservice consultant, team builder and a multiple award winner for excellence in hospitality, restaurant development and branding. ​As the former Director of the Global Food and Beverage Practice at PricewaterhouseCoopers, Ms. Spiegel has clearly proven her food and beverage skills to the betterment of her public and private clients, providing strategic growth plans, financial models and market positioning. 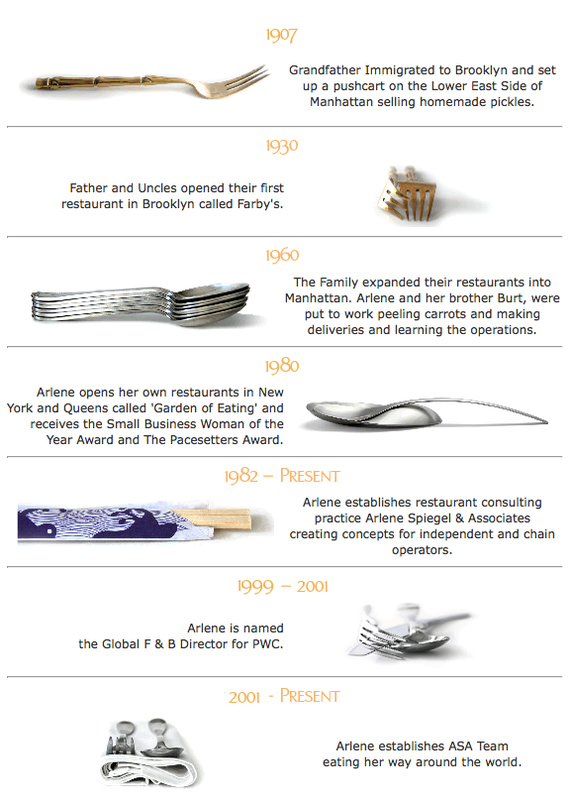 As a third generation restaurateur, Arlene has dedicated her entire professional life studying the eating and purchasing habits of consumers in every possible food and beverage environment. Having owned and operated successful restaurants In the New York area, Ms. Spiegel understands first hand, the challenges, responsibilities and rewards of ownership. Her restaurants, The Garden of Eating, capitalized on the growing demand for ‘good for you’ style eating and resulted in Ms. Spiegel receiving the coveted Pacesetter Award and The Small Business Woman of the Year Award. Working with all segments of the hospitality industry, including branded restaurants, bars, academic and cultural Institutions, Independent entrepreneurs, corporate chain restaurants, real estate developers, retail, contract management, gaming and entertainment clients, Ms. Spiegel, has been highly successful in developing differentiated and compelling branded concepts; master plans for public and private developments; engineered profitable menus; and orchestrating experiential and memorable food programs. Her renowned clients, including celebrity chefs, say that her enthusiasm brings new spirit and energy to their projects. They consider her an Invaluable thought partner in starting or transforming their concepts. Some recent projects include: The Pennsy Food Hall, Montclair Social Club, Ford Foundation, and neighborhood gem, MOKUM. Other notable projects include: Master Food Plan for the World Financial Center; Eight original restaurants for Sea World, Four original restaurants for Harrah’s Casino; Hu Kitchen & Market; Hill Country BBQ; Hill Country Chicken; Myron’s Delicatessen for Isle of Capri Casino; The Mediterranean Room; Cafe 57 for Hearst World Headquarters; Flint Creek Steakhouse for the Cherokee Nation Casinos; and One West Cafe for UPHS. Ms. Spiegel is a member of the National Restaurant Association, The Foodservice Consultants Society International, The IBM Foodservice Consulting Consortium, The Roundtable for Women In Foodservice, and she served as the National Chairperson for the Symposium on Food Trends. She often is quoted in several National trade publications, The Wall St. Journal, NY Times, NY POST and Crain’s NY Business. She is a frequent guest on CNN and CNBC.